Problem is……….I don’t like it. Currently the turn process is IGOUGO – I want something that throws that about a bit and allows one side to get a bit of initiative over the other for a while. I have an idea for a supply convoy mechanism which links to the ability of the Axis side being able to attack – but I can’t seem to get it working within the strategic game I want working around the players. Hmmm. I have separate force cards for each side – and this seems to allow for the management of each side and the effects of the strategic cards – but I feel it does not give a good feeling of managing limited resources I want the game to give the player. 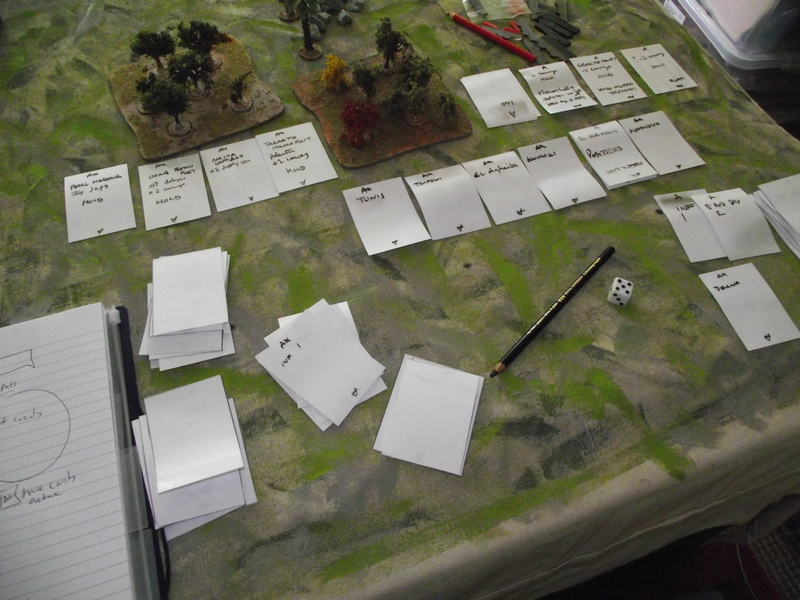 I don’t want to get to any point where the player has to either note stuff down or remember things – it all has to be at the finger tips on the held cards. I might use an abstract strength system instead backing up the historical army card. Historical events and strategic events feed into the capabilities of the armies on the spot – i.e the players hand – I’m not sure yet how much the player should be able to affect these – and how ahistorical the game will allow the player to be – i.e would the game be able to set up the fall of Malta? how would this have affected the campaign, and how is that represented in the game? I need to throw this up and start again! !